Perceive what's gone missing from the web. Since the start of the World Wide Web thousands of anti-war and pro-peace projects have already come and gone. Now GetPeaceful.org presents a first-ever collection of its kind documenting the traces of anti-war movements that have disappeared among the sponsored links, spams, and twittering machines of today's infoverse. Contemporary search engines have a tendency to make dead websites disappear quietly. 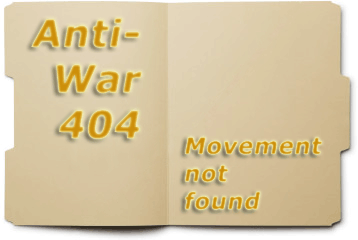 AntiWar404 counteracts some of the resulting amnesia. It offers a concise record of the peace movement forgotten by Google, resurrecting pages and pages of war resistance that you won't find in your search engine results. Peace documents re-found!